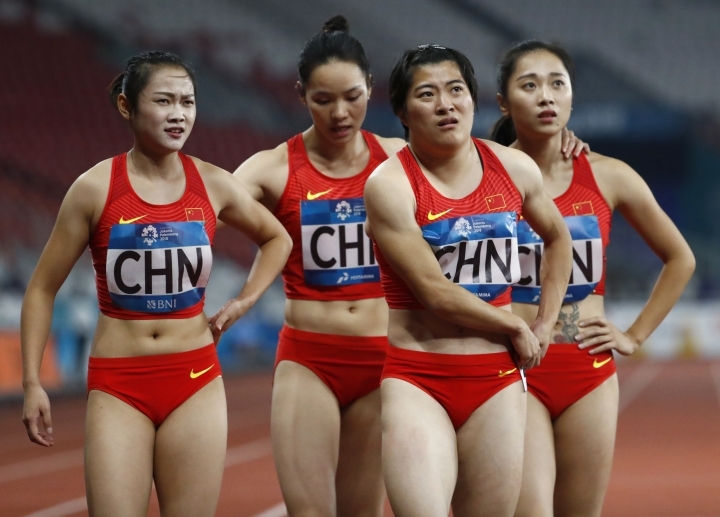 The head of the international track and field federation says China and Japan are the two most improved countries in athletics over the last six or seven years. JAKARTA, Indonesia — Almost unthinkable to some a decade ago, sprinters from China and Japan are running sub-10 seconds for the 100 meters. 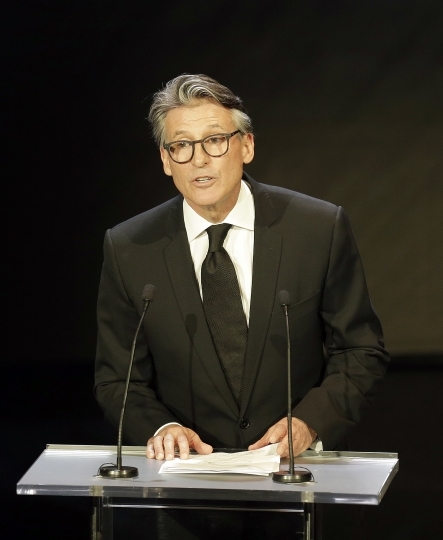 "You could argue Japan and China are two of the most improved athletics nations over the last six or seven years," Coe told the Associated Press during the Asian Games, where China topped the athletics medal standings. "For me, it's very clear. "They're making very good progress. If we'd been sitting here a decade ago, talking about potential here for a China athlete to run 9.8, you'd have probably taken quite long odds on that." 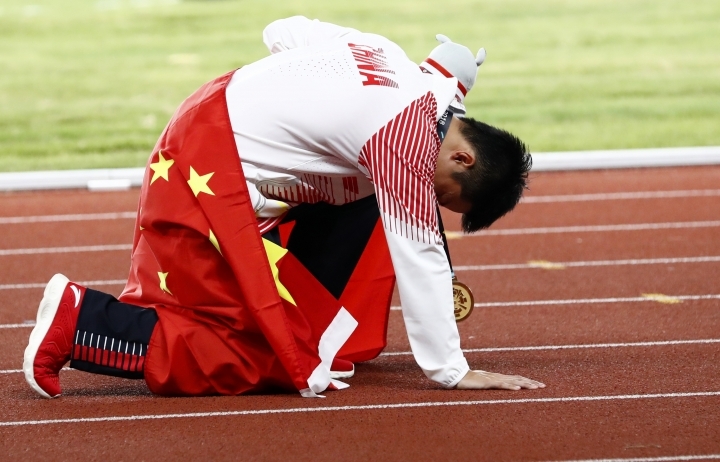 Su Bingtian ran an Asian Games record 9.92 seconds to win the 100 in Jakarta, one-hundredth outside his continental record of 9.91 He ran that in Spain in June, three days after he'd lost his Chinese national record when Xie Zhenye clocked 9.97. Only three sprinters — all American — have run a faster time in 2018. Su is expecting to go faster, too, because he can be pushed by teammates from the Chinese relay that won the bronze on home soil at the 2015 world championships. He has been working since late last year with Randy Huntington, who was coaching Mike Powell when the American set the long jump world record way back in 1991. Already, Su's PB has improved. He's down from 9.99, set in 2015, and this year already he has set the Asian record in the 60 and the 100. Huntington has predicted China will be a track and field force at the 2024 Olympics. Japan took silver in the Olympic men's 4x100-meter relay at Rio de Janeiro in 2016, and bronze at the world championships last year. 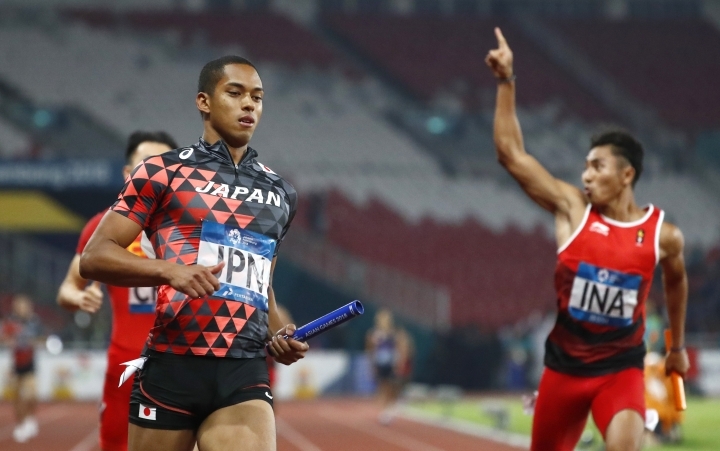 The Japanese relay team won the men's 4x100 on the last night of track at the Asian Games and is targeting a medal at the 2020 Tokyo Olympics. 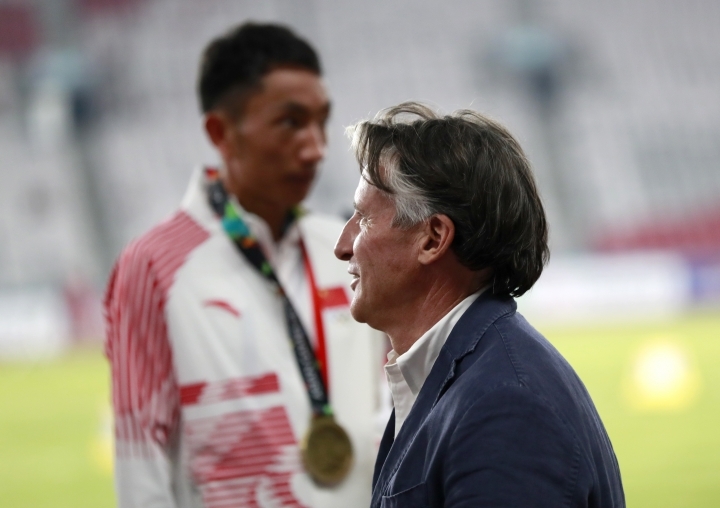 Coe said the federations in Japan and China had "greater clarity" around the importance of coaching. 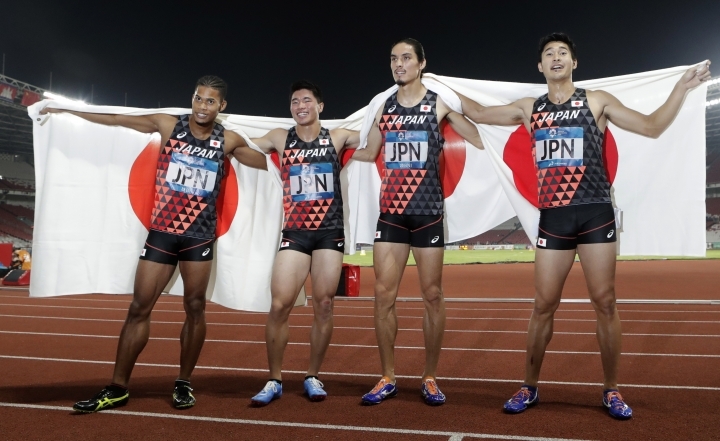 Only five Asian sprinters have run 10.00 or faster this year, but the frequency is increasing. Looking abroad for coaching expertise isn't the sole domain of China and Japan. 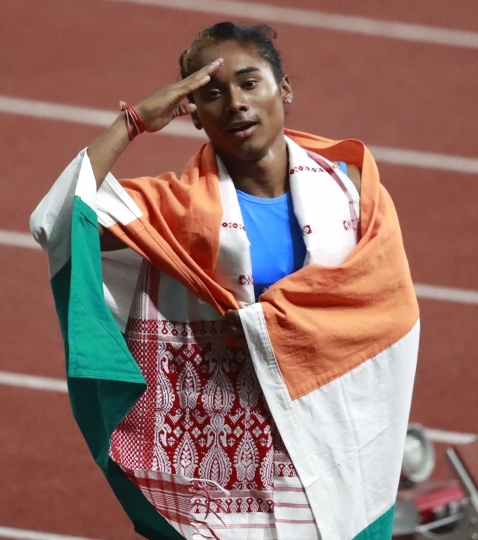 South Korea has brought in a performance director from the United States, India has drafted in foreign coaches including 72-year-old Galina Bukharina of Romania, who has been working with world junior 400-meter champion Hima Das. Harry Marra, who worked with Olympic champion and decathlon world-record holder Ashton Eaton, has been helping out with Indonesia's world junior 100-meter champion Lalu Zohri. India placed third, a medal above Japan, in the track and field standings with seven golds, 10 silver and two bronze. It also won a fifth straight title in the women's 4x400. It was a vast improvement on the 2 gold and 13 overall from the Asian Games in 2014. South Korea finished with five medals on the track, including gold in the women's 100-meter hurdles, but Randy Behr, the head performance coach, was expecting big improvements in coming seasons with extra emphasis on strength and conditioning and recovery. "Asia has been a little bit intimidated about the weight room and off-season training — the myths that the U.S. went through in the '70s and 80s," said Behr, who worked in fitness for the U.S. military and as a coach in track and American football. "Now they've embraced, 'Hey, it's OK to get in the weight room and throw some iron around.' It does transfer. It's physics." While the popularity of track and field has dropped in some traditional markets, the sport is growing across the most-populated continent. "China is growing amazingly. Japan is solid. Korea, we have a huge ceiling — we're onto something good here," Behr said. "Asia is on the move. "I predict Korea with a sub-10 very soon and, of course, China and Japan — they're not stopping." 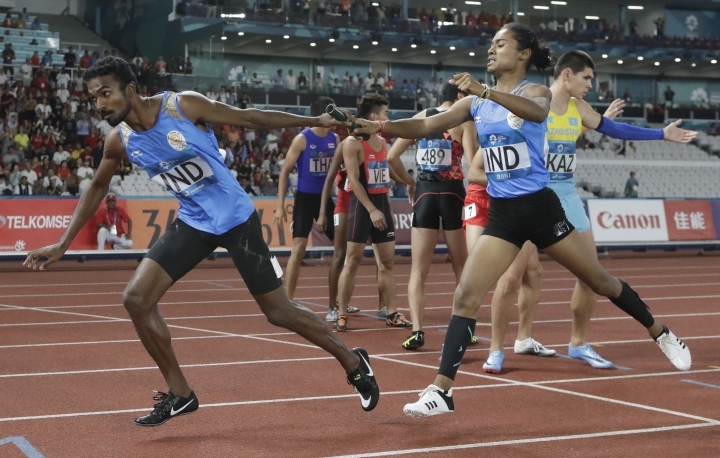 The 18-year-old Zohri placed seventh in the Asian Games 100 final, but was a key runner in the Indonesia relay team that finished as a surprising silver medalist between Japan and China. "There's scope for a lot more," two-time Olympic gold medalist Coe said of the stories like Zohri, who is from the earthquake-ravaged island of Lombok. "Rarely in athletics are there happy accidents. You can look at something that on the surface looks like a rough diamond that suddenly emerges." In the case of Zohri, Coe said Marra had been "explaining what the next step of the journey is. He's coaching the coaches, but also has some hands on. "There's no question at all, the rough diamond is shining. Everything in athletics is about technique and coaching. If you haven't got world-class coaching, frankly, it's a rare happy accident that somebody emerges."